I had found a seat out of the way and fairly close to the small stage in the upper room above the pub. People were coming in, finding chairs and getting out pads and pencils. I started to draw straightaway in my smallest sketchbook, rough fast images to loosen up my hand and brain. With reference to the legend on the sketch, it wasn’t the semi nakedness that threw me, it was the horse’s head (when I drew the next sketch, it was hidden from my view – I think he is still holding it but it’s obscured by the head of the lady in front of me). Such is my ignorance of contemporary culture, I did not at this point know the significance of the white horse, nor of owls or logs or layers of plastic. Four hours of drawing were opened, compered and closed by jazz and blues singer Liberty Pink. My first drawings, while she sang and then posed for 15 minutes, were done blocking in colour in conte crayon and drawing into this with brush pen. I feel these did her looks and movement little justice. I think the very last sketch of the afternoon, drawn in pen and water as she sung her closing blues tribute to coffee, captured her style and demeanour better. The next post involves the horses head. 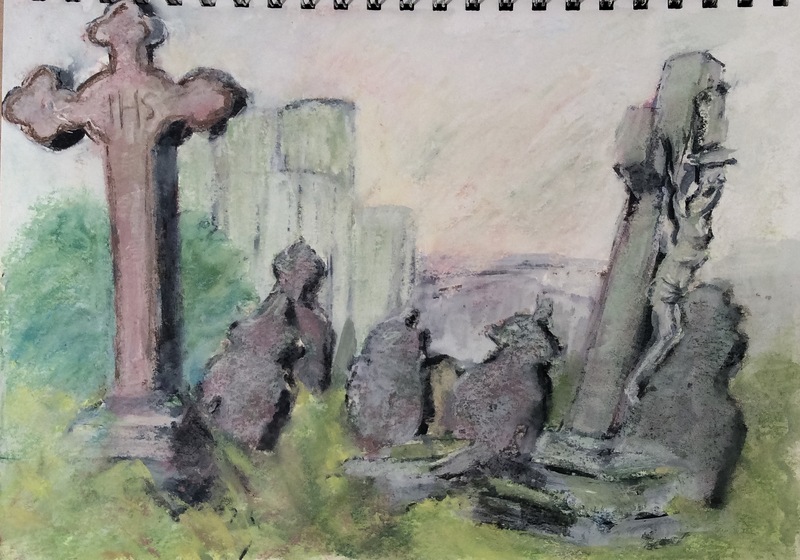 This is the sketch from Saturday started in St Joseph’s church in Duddeston looking across graveyards to the brewery as evening fell. Since then I re-suspended that first layer in wet white gouache and let this dry overnight. The next evening I drew back into this with a further layer of chalk and gouache. The sculpted cross nearest me bore the inscription IHS. This turns out to be a christogram, a westernised translation of the first three letters iota-eta-sigma of the word IHΣΟΥΣ, “Jesus”. When looking this up, I found these three letters came also to stand for Iesus Hominum Salvator, meaning Jesus, saviour of men. The newly acquired meaning is called a backronym. I and J are interchangeable in the Latin alphabet. The letter Σ can be written in its lunate form C. From this comes IHC, or JHC, by which route the Christian saviour acquired, in popular parlance, his middle initial. 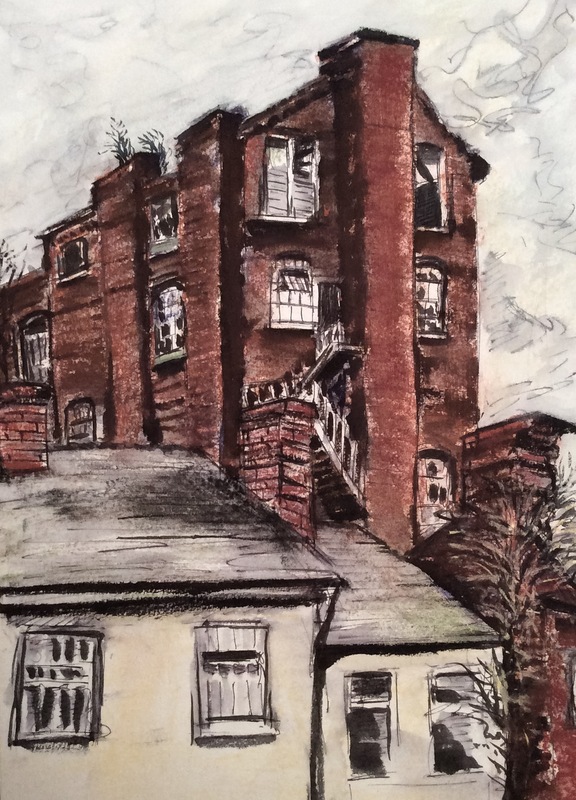 I joined the Birmingham Urban Sketching group for the 50th worldwide sketchcrawl. They had organised to draw in the Chinese Superstore and then in the neighbouring catholic church. I arrived on location late and only joined up with the group at the very end of the day. 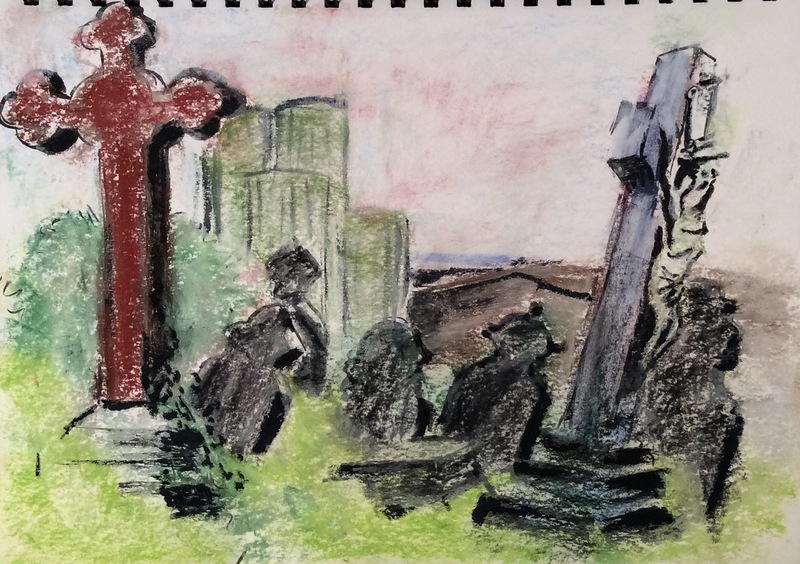 I was reluctant to draw indoors and was put off drawing in the churchyard by the incongruity of my taking my leisure while the grounds were being tidied by people working under constraint in high visibility jackets bearing the logo “Community Payback”. 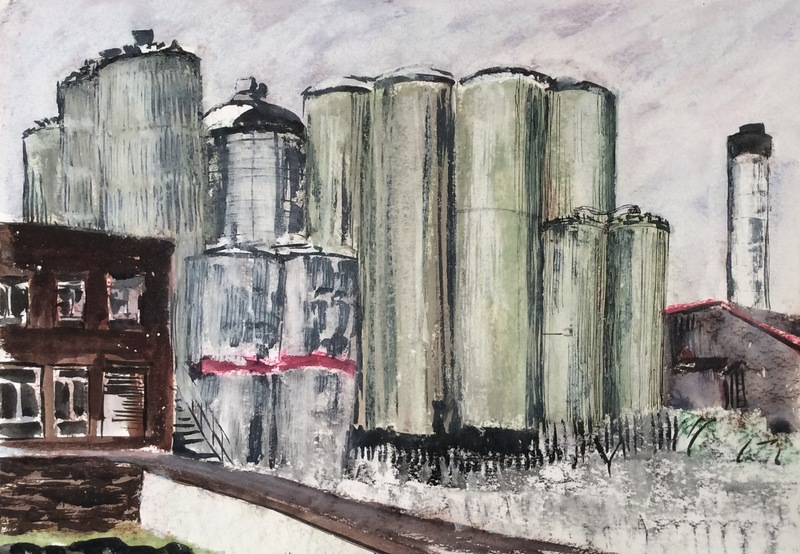 I found a secluded car park behind a bank with a view over industrial tanks – what I now know to be the Aston Manor Brewery. 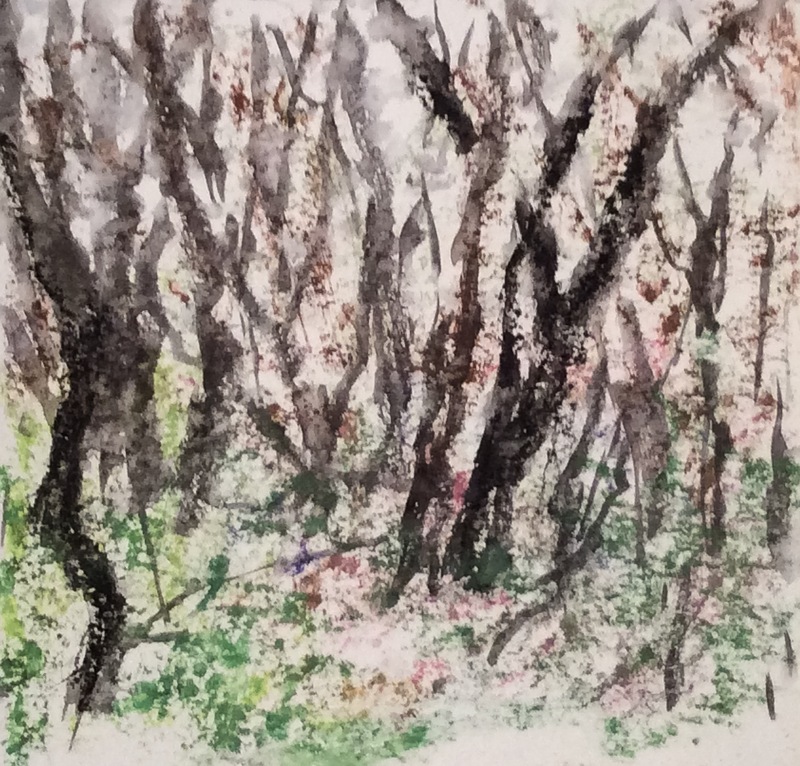 I had had an idea I wanted to work on, laying down a base in conte crayon to define shapes, layering over this in white gouache and then drawing back into the drying pigment with ink brush and sharp pen. The intention is to build texture. It is probably overworked. On my way up I had passed a ruined building standing proud above the low industrial units. This turns out to be called Lallian’s Mill. Local historians do not seem to know much more about this mill, but it seems to have started life as part of the brewing industry, perhaps preparing the malt. A few derelict buildings enthusiasts have explored it, revealing aging and rusting machinery, hoppers, trucks and large cogs. Empty sacks show its last use to have been as a mill making chappati flour. I had positioned myself across the road in the empty forecourt of an industrial unit, which then became busy. A worker stopped to talk. He had grown up locally and remembered when this factory caught fire. One end of the roof is scarred and broken, with sky revealed through the rafters, seen through the windows in my sketch. 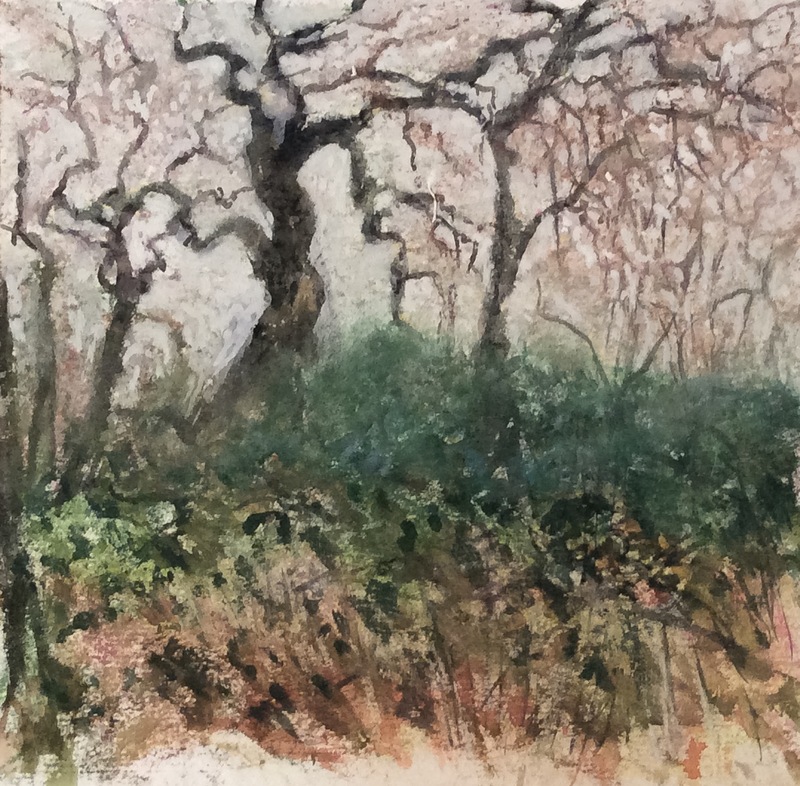 This sketch was drawn first in fountain pen and water and then overlaid with crayon. As always, I should have stopped sooner. I was puzzled by the shadows and direction of the light. It was only later that I could see that the light was diffuse and the lightest surfaces were the flattest, whereas it was the corners which were shaded, in whichever direction they faced. This is not properly shown in my sketch. At the end, I arrived back at the churchyard, which overlooks the brewery. I had no more than twenty minutes to draw, so put a very rough sketch on paper with crayon first then ink brush. Overhead, I caught the silhouette of a falcon flashing past the church and heard the call of a peregrine. They apparently are known to nest (presumably later in the year) in the nearby National Grid building. These are three exercises in capturing the sky and bare trees of winter. It was very lightly raining. The conte crayons marked unevenly, speckling on the textured paper and giving deeper tones where they chanced to hit rain drops. The trees were drawn in using a black ink brush pen. The paper was by then sufficiently wet that the ink bled, softening the marks. I had emerged from the woods and skirted a field. The point of this sketch was to show texture and tone in what appeared a heavy white/grey sky and its reflection in standing water on the grass. 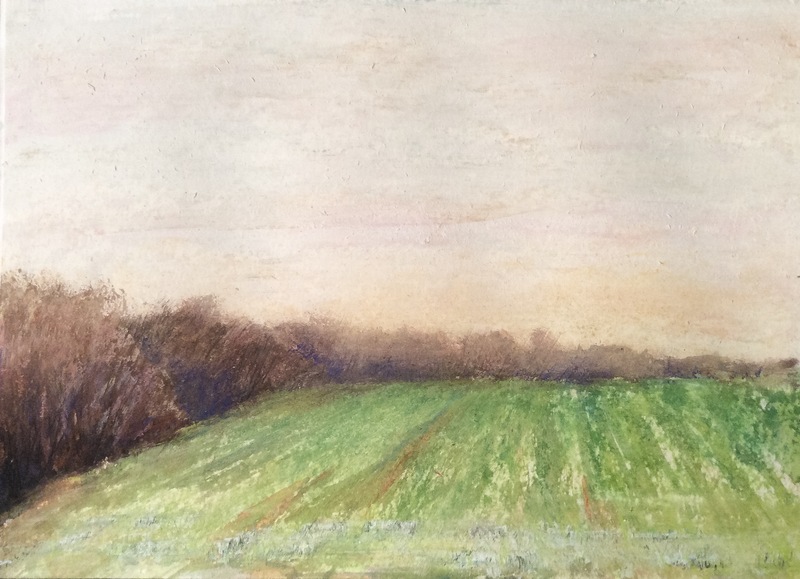 In the field, I blocked this in crayon, covering the colours with a heavy layer of white. Once home, I completed the sky by covering it with wet gouache so the tones still showed through.